Seven Deadly Sins…or Lifesaving Virtues? We’ve all heard of the seven deadly sins, but not everyone realizes just how much they can do for your advertising efforts. Paul Klebanov introduces the shocking reality behind today’s top converting copy, with a step-by-step process set to produce some of the highest converting ad and landing page copy on the planet. If you look towards your competitors and wonder how they never fail to guide their visitors to click on their ad and purchase their products, then this is the webinar for you. Feeling Gluttonous? People have an innate desire to overindulge. This goes for goods too, and can be utilized to attract visitors to your offer. This particular sin works wonders when you are dealing with a wealthier, more affluent audience who can afford to splurge on your offerings. Sloth got you down? The more technology progresses, the lazier we get. We all want to get as much as possible while doing as little as possible, and by showing your audience that they can get something incredible from the comfort of their home, you’re sure to reel them in. Don’t swallow your pride! Everyone wants to feel special, and by learning how to entice your customers with clever methodologies that make them feel proud to be associated with you – you’ve hit the nail on the head. Customers want status, and by presenting them with this in an easy and convenient fashion, your success will be locked and loaded. Greed knows no boundaries. We all want more than we need, and this can be very advantageous as a product/service provider. By learning how to successfully offer your customers incredible value for money, you’ll send your business soaring. Lust for Life! People lust after things they think they can’t have – until you show them that they can. The sin of lust can be very powerful when enchanting your customers. Eat from The Grapes of Wrath! Paul will show you exactly how the sin of wrath can give you incomparable exposure, inclusive of reviews and criticism – both positive and constructive alike. People want to share their opinion – and it’s your responsibility to present them with that platform. Green with Envy? Just like we want things we can’t have, we also want things that we see other people are going crazy for. Customers want to follow trends, and by setting one, you’ll send green waves of fury spreading throughout your audience – to your advantage. It’s important to stay ahead of the game and tap into the strategies that will send you leaps and bounds ahead of your competitors. 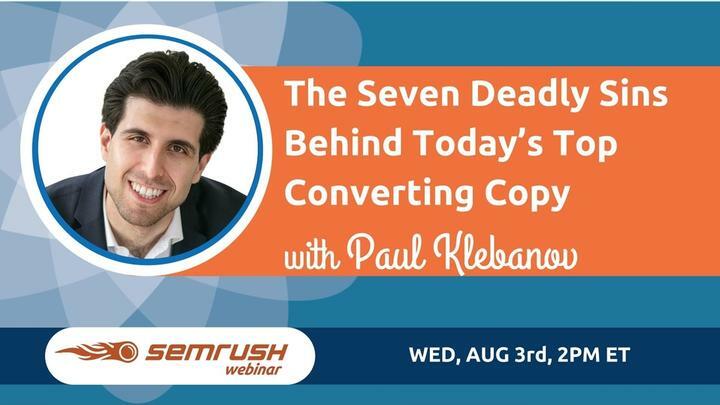 Sign up for Paul Klebanov’s webinar today!